The significance of these terms are reflected by the conception of what can be expected in combat in encirclement operations. A cauldron is expected to be "boiling" with combat activity, the large enemy forces still quite able to offer "hot" resistance in the initial stages of encirclement, and so are to be contained, but not engaged directly. 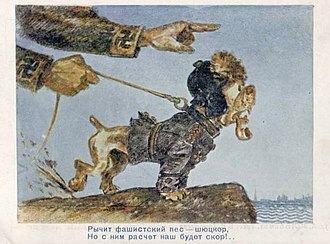 A sack in Soviet experience was often created as a result of operational breakthroughs, and was sometimes as unexpected for the Soviet command as for the enemy. This encirclement, sometimes of an entity of unknown size, tended to move for some time after the initial encirclement due to inherently dynamic nature of operational warfare. By contrast a nest was a reference to a tactical, well-defined and contained encirclement of enemy troops that was seen as a fragile construct of enemy troops unsupported by its parent formation (the use of the word nest is similar to the more familiar English expression machine gun nest). 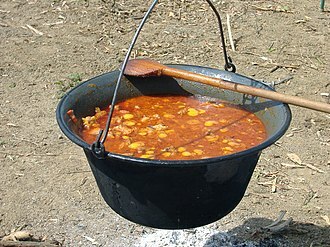 In German the word Kessel (literally a cauldron) is commonly used to refer to an encircled military force, and a Kesselschlacht (cauldron battle) refers to a pincer movement. The common tactic which would leave a Kessel is referred to Keil and Kessel (Keil means wedge). Kessel is a loanword in English texts about World War II. 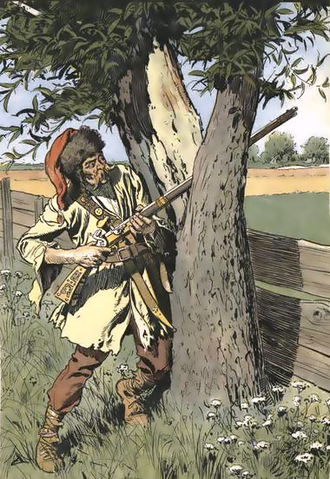 Another use of Kessel is to refer to Kessel fever, the panic and hopelessness felt by any troops who were surrounded with little or no chance of escape. In Spanish the word Cerco (literally a fence or siege) is commonly used to refer to an encircling military force. 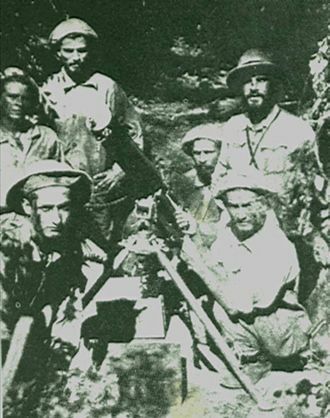 Cercos were particularly common in the Chaco War between Bolivia and Paraguay (1932–1935) and encirclement battles were decisive for the outcome of the war. In the Campo Vía pocket 7,500 Bolivians were taken prisoner out of an initial combat force of 10,000. 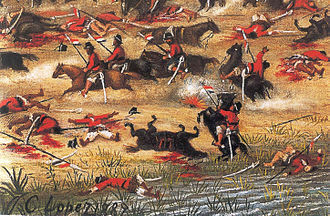 Other cercos of the war include the battle of Campo Grande and the battle of Cañada Strongest. Motti is Finnish military slang for a totally encircled enemy unit. The tactic of encircling it is called motitus, literally meaning the formation of an isolated block or "motti", but in effect meaning an entrapment or envelopment. The word means "mug" in many Finnish dialects; an alternate translation refers to a cubic meter of firewood, a relatively small area in which an encircled enemy could be "cut down" like trees. motti is thus related to kessel. 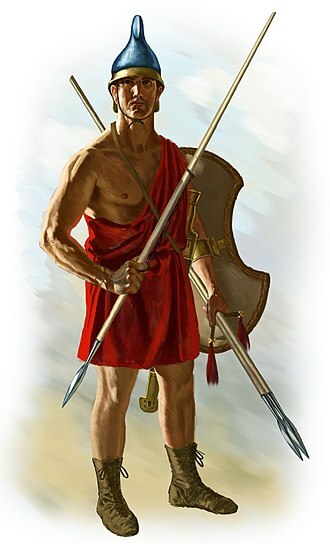 A motti in military tactics therefore means the formation of "bite sized" enemy units which are easier to contain and deal with. This tactic of envelopment was used extensively by the Finnish forces in the Winter War and the Continuation War to good effect. It was especially effective against some of the mechanized units of the Soviet Army, which were effectively restricted to the long and narrow forest roads with virtually no way other than forwards or backwards. 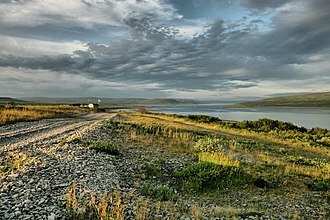 Once committed to a road, the Soviet troops effectively were trapped. Unlike the mechanized units of the Soviets, the Finnish troops could move quickly through the forests on skis and break columns of armoured Soviet units into smaller chunks (e.g., by felling trees along the road). Once the large column was split up into smaller armoured units, the Finnish forces attacking from within the forest could strike the weakened column. The smaller pockets of enemy troops could then be dealt with individually by concentrating forces on all sides against the entrapped unit. 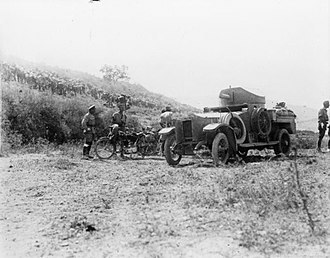 A motitus is therefore a double envelopment manoeuvre, using the ability of light troops to travel over rough ground to encircle enemy troops on a road. Heavily outnumbered but mobile forces could easily immobilize an enemy many times more numerous. By cutting the enemy columns or units into smaller groups and then encircling them with light and mobile forces, such as ski-troops during winter, a smaller force can overwhelm a much larger force. If the encircled enemy unit was too strong, or if attacking it would have entailed an unacceptably high cost, e.g., because of a lack of heavy equipment, the motti was usually left to "stew" until it ran out of food, fuel, supplies, and ammunition and was weakened enough to be eliminated. 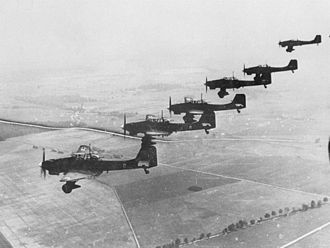 Some of the larger mottis held out until the end of the war because they were resupplied by air. Being trapped, however, these units were not available for battle operations. The largest motti battles in the Winter War occurred at the Battle of Suomussalmi. 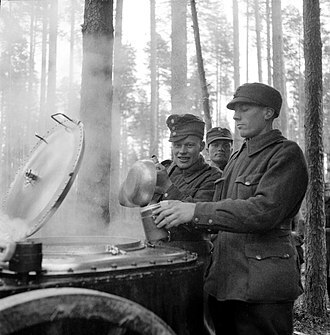 Three Finnish regiments enveloped and destroyed two Soviet divisions as well as a tank brigade trapped on a road. 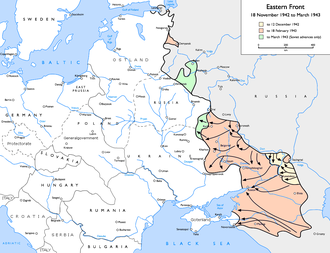 Almost the entire Soviet Western Front was encircled and destroyed by the Germans in the Battle of Bialystok-Minsk. 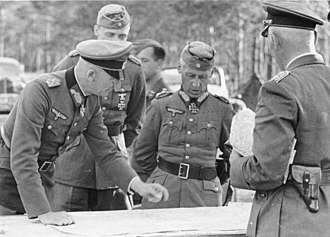 Later, 230,000 Soviet troops were captured in a pocket at Smolensk when isolated by the Panzer forces of Generals Heinz Guderian and Hermann Hoth on August 5, 1941. During the Siege of Odessa, German and Romanian forces encircled and captured thousands of Soviet troops. At the end, most of the Soviet Southwestern Front (about 450,000 soldiers) was encircled in the First Battle of Kiev. 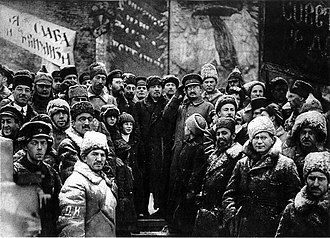 In the winter of 1942, thousands of German troops were encircled in the Demyansk Pocket in northwestern Russia, but were relieved the following spring. In the winter of 1942, 5,500 German troops were encircled by the Soviets in the Kholm Pocket. 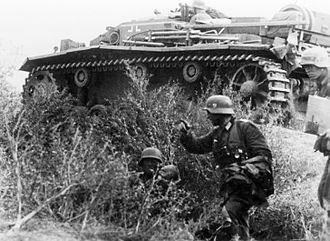 In the spring of 1942, thousands of Soviet troops engaged in an offensive thrust were encircled during the German counterattack in the Second Battle of Kharkov. In November 1942, during the Battle of Stalingrad, nearly all of the German Sixth Army was encircled and destroyed in Operation Uranus. The Italian Army in Russia and Second Army (Hungary) were similarly eliminated during Operation Little Saturn. 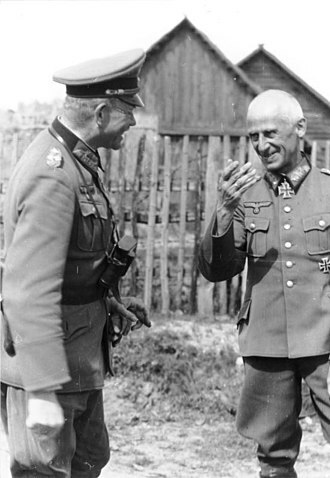 In late 1942 and early 1943, some 50,000 German troops were, under much higher losses, encircled and annihlated by the Soviets in the Velikiye Luki Pocket. In early 1944 the German 8th Army was encircled in the Korsun Pocket; though could eventually break out with both sides suffering heavy losses. In March 1944 the 1st Panzer Army was trapped by the Soviets in the Kamenets-Podolsky pocket (aka Hube's Pocket), but was able to inflicted high losses and broke out. In May 1944, nearly half the German and Romanian garrison in modern Crimea were captured during the Crimean Offensive, primarily in Sevastopol. 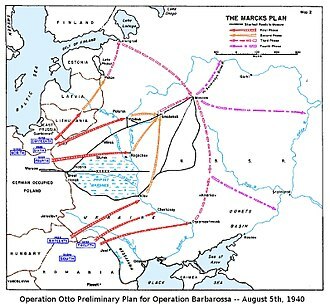 In June and July 1944, over 500,000 German troops were killed or captured during Operation Bagration in modern Belarus. 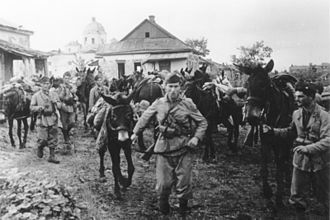 In August 1944, over 800,000 German and Romanian troops were overrun in the second Jassy-Kishinev Offensive in modern Romania. In September 1944, following the D-Day landings, the German Seventh Army was trapped in the Falaise pocket. Also in September 1944, during the Battle of Arnhem, a reinforced British Airborne division was trapped in a pocket the Germans called the Hexenkessel (lit. The Witches' Cauldron), suffering over 8,000 casualties. In 1944, thousands of Germans troops were encircled by a mostly Canadian force in the Breskens Pocket during the Battle of the Scheldt. 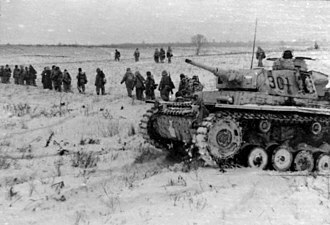 In winter of 1944–1945, a large number of German troops was isolated in the Courland Pocket in northwestern Latvia until the end of the war. In the same winter German troops were encircled in the Memel pocket, however they eventually were evacuated by sea. Also during the winter of 1944–1945, nearly 300,000 German troops were overrun in the Vistula-Oder Offensive in modern Poland. 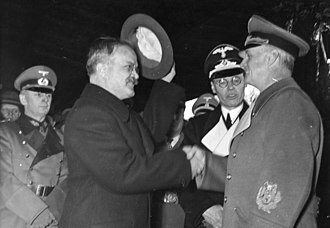 In 1944–1945, 180,000 German and Hungarian troops were isolated by Soviet troops in the Siege of Budapest. In 1945 the German 9th Army was destroyed in the Battle of Halbe. 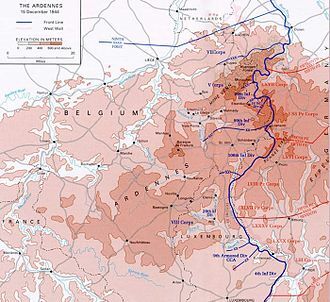 In 1945, 325,000 German troops were isolated and captured by advancing American armies in the Ruhr pocket. 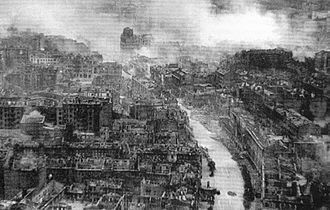 In April and May 1945, over 750,000 German troops were encircled and destroyed in the Battle of Berlin and collapse of Nazi Germany. Finally in August 1945, over 400,000 Japanese and Manchurian troops were encircled over a broad area during the Soviet invasion of Manchuria. The Hornet's Nest during the Battle of Shiloh in the American Civil War, where two Union divisions were surrounded, cut off from the rest of the army, and held out against ferocious Confederate attacks for six hours before surrendering. Campo Vía in the Chaco War. In the Yugoslav Wars the Medak Pocket was a Serb-populated area in Croatia that was invaded by Croatians in September 1993. In the War in Donbass, Ukrainian troops were encircled at Ilovaisk in August 2014, suffering heavy material and human losses. ^ Hastings, M. (2006) . Overlord: D-Day and the Battle for Normandy (reprint ed.). New York: Vintage Books USA. p. 313. ISBN 0-307-27571-X. ^ Mitcham, Samuel W. (2001). Crumbling Empire: The German Defeat in the East, 1944. Westport, CT: Praeger. p. 65. ISBN 978-0-275-96856-4. ^ "Battlefield Manchuria – The Forgotten Victory", Battlefield (documentary series), 2001, 98 minutes. ^ Cunningham, O. Edward (2007). Joiner, Gary; Smith, Timothy, eds. 'Shiloh and the Western Campaign of 1862. New York: Savas Beatie. p. 298. ISBN 978-1-932714-27-2. ^ de Quesada, Alejandro (2011). The Chaco War 1932-35: South America’s greatest modern conflict. Osprey Publishing. ISBN 9781849084161. ^ "Consolidated Indictment". The Prosecutor v. Rahim ADEMI and Mirko NORAC. International Criminal Tribunal for the Former Yugoslavia. 27 May 2004. Retrieved 20 April 2012. ^ "More Ukrainian soldiers killed as fighting rages in east, peace move flops". Reuters. 16 July 2014. Retrieved 16 July 2014. Look up cerco, Kessel, or motti in Wiktionary, the free dictionary. The Chaco War was fought between Bolivia and Paraguay over control of the northern part of the Gran Chaco region of South America, which was thought to be rich in oil. It is referred to as La Guerra de la Sed in literary circles and it was the bloodiest military conflict fought in South America during the 20th century, between two of its poorest countries, both having previously lost territory to neighbors in 19th-century wars. During the war, both landlocked countries faced difficulties shipping arms and supplies through neighboring countries, Bolivia faced particular external trade problems, coupled with poor internal communications. Although Bolivia had lucrative mining income and a larger, better-equipped army, a series of factors turned the tide against it, the ultimate peace treaties granted two-thirds of the disputed territories to Paraguay. The origin of the war is commonly attributed in Latin America to a conflict between the oil companies Royal Dutch Shell backing Paraguay and Standard Oil supporting Bolivia. The discovery of oil in the Andean foothills sparked speculation that the Chaco might prove a source of petroleum. Standard Oil was already producing oil wells in the high hills of eastern Bolivia. However, it is if the war would have been caused solely by the interests of these companies. Both Bolivia and Paraguay were landlocked, though the 600,000 km2 Chaco was sparsely populated, control of the Paraguay River running through it provided access to the Atlantic Ocean. This became especially important to Bolivia, which had lost its Pacific coast to Chile in the 1879 War of the Pacific, Paraguay had lost almost half of its territory to Brazil and Argentina in the Paraguayan War of 1864-1870. The country was not prepared to surrender its economic viability, in international arbitration, Bolivia argued that the region had been part of the original Spanish colonial province of Moxos and Chiquitos to which Bolivia was heir. Meanwhile, Paraguay based its case on the occupation of the land, as of 1919, Argentine banks owned 400,000 hectares of land in the eastern Chaco while the Casado family, a powerful part of the Argentine oligarchy, held 141,000. A machine gun is a fully automatic mounted or portable firearm designed to fire bullets in quick succession from an ammunition belt or magazine, typically at a rate of 300 to 1800 rounds per minute. Note that not all fully automatic firearms are machine guns, submachine guns, assault rifles, pistols or cannons may be capable of fully automatic fire, but are not designed for sustained fire. Many machine guns use belt feeding and open bolt operation, unlike semi-automatic firearms, which require one trigger pull per round fired, a machine gun is designed to fire for as long as the trigger is held down. Nowadays the term is restricted to heavy weapons, able to provide continuous or frequent bursts of automatic fire for as long as ammunition lasts. Machine guns are used against personnel and light vehicles, or to provide suppressive fire. Some machine guns have in practice sustained fire almost continuously for hours, because they become very hot, practically all machine guns fire from an open bolt, to permit air cooling from the breech between bursts. They usually have either a barrel cooling system, slow-heating heavyweight barrel, although subdivided into light, heavy or general-purpose, even the lightest machine guns tend to be substantially larger and heavier than standard infantry arms. Medium and heavy guns are either mounted on a tripod or on a vehicle, when carried on foot. 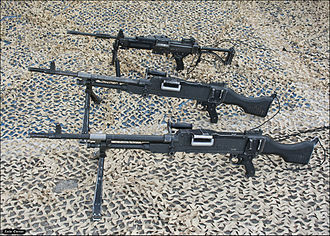 Medium machine guns use full-sized rifle rounds and are designed to be used from fixed positions mounted on a tripod. 50in, the M249 automatic rifle is operated by an automatic rifleman, but its ammunition may be carried by other Soldiers within the squad or unit. The M249 machine gun is a crew-served weapon, Machine guns usually have simple iron sights, though the use of optics is becoming more common. Many heavy machine guns, such as the Browning M2.50 caliber machine gun, are enough to engage targets at great distances. During the Vietnam War, Carlos Hathcock set the record for a shot at 7382 ft with a.50 caliber heavy machine gun he had equipped with a telescopic sight. This led to the introduction of.50 caliber anti-materiel sniper rifles, selective fire rifles firing a full-power rifle cartridge from a closed bolt are called automatic rifles or battle rifles, while rifles that fire an intermediate cartridge are called assault rifles. Unlocking and removing the spent case from the chamber and ejecting it out of the weapon as bolt is moving rearward Loading the next round into the firing chamber. Usually the recoil spring tension pushes bolt back into battery and a cam strips the new round from a feeding device, cycle is repeated as long as the trigger is activated by operator. Releasing the trigger resets the trigger mechanism by engaging a sear so the weapon stops firing with bolt carrier fully at the rear, the operation is basically the same for all autoloading firearms, regardless of the means of activating these mechanisms. Most modern machine guns use gas-operated reloading, a recoil actuated machine gun uses the recoil to first unlock and operate the action.